Eugene Artebasov has recently joined Turbomilk team. He behaves in the office as a decent and even intelligent person. He has shown himself to good advantage. But let’s take a closer look at him; let’s peek at his inner world. Oh God! There are monsters inside! Many monsters! Pretty and touching monsters. Eugene’s soul is large and he is ready to share his inner monstroworld. This world has brought to life the Monsters icon set. 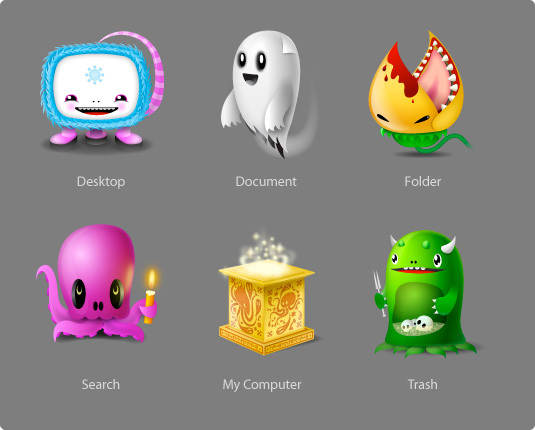 You can use these icons to scare kids to death right on your desktop. The monsters are for free and please feel free to use them at your discretion. These materials can be used for any purposes with obligatory indication of the author. If you want to hire us or would like to learn more about our work, feel free to email us at info@turbomilk.com.